Obama and the Pope Agree to Disagree on "Life"
The Catholic leader, who has gained national prominence for his outspoken pro-life advocacy and aggressive criticism of pro-choice Democratic politicians, is still more than a decade away from reaching the church's automatic retirement age of 75. Martino's abrupt resignation, along with the fact that he was not reassigned to another position within the church, has some church insiders suggesting that the highly unusual move was far from voluntary  and quite possibly the work of a Vatican that has been decidedly less openly critical of the Obama Administration. Whether Martino is leaving willingly or not, his departure means that one very vocal critic of the Administration has lost his bully pulpit. That may come as a relief to some within the U.S. Conference of Catholic Bishops (USCCB) who have become increasingly disturbed by the politicization of some church leaders this year, most notably in protests against President Obama's invitation to speak at Notre Dame and the role of some church officials at Senator Ted Kennedy's funeral service and burial. During the 2008 campaign, Martino focused particular attention on vice-presidential nominee Joseph Biden, a Scranton native and Catholic Democrat. The bishop declared that Biden would be denied communion if he tried to receive it at any church in the diocese, which covers the northeast quarter of the state  "I will be truly vigilant on this point," said Martino. And he warned his parishioners that there would be dire consequences for supporting Biden and the Democratic ticket. In October, Martino directed that a letter be read at all Sunday masses, charging that a vote for a pro-choice politician was the same as supporting "homicide." He also instructed priests to deny communion to anyone they believed publicly supported abortion rights. Finally, shortly before Election Day last fall, as David Gibson of AOL's Politics Daily reported, Martino showed up unannounced at a voter-education forum at a Honesdale parish to criticize organizers for discussing the comprehensive election guide endorsed by the USCCB instead of the letter he had drafted for the diocese on abortion. "No USCCB document is relevant in this diocese," Martino declared of the guide he objected to, which stated that there were a lot of issues, not just abortion, that Catholic voters should consider when making a decision about whom to support. "The USCCB doesn't speak for me." Such comments didn't endear him to the parishioners who organized the forum or to his immediate superior, Philadelphia Cardinal Justin Rigali. As head of the USCCB's Committee on Pro-Life Activities, Rigali is just as opposed to abortion as Martino. But he is a much more politic figure. Many think Martino finally went too far this spring, when he started training his sights on Bob Casey Jr., a Democratic Senator from Pennsylvania and a staunchly pro-life Catholic. Casey's late father, a former governor of Pennsylvania, is revered by Catholics for speaking out against the Democratic Party's support for abortion rights. But that didn't stop Martino from sending Casey letters  also issued as press releases  warning the Senator that his opposition to abortion was insufficient. In one such letter, Martino wrote that Casey "persist[s] formally in cooperating with the evil brought about by this hideous and unnecessary [abortion] policy" and suggested that the Senator could be denied the Eucharist in the Scranton diocese. The situation came to a head this spring, when King's College in Wilkes-Barre invited Casey to speak at its commencement ceremony. Objecting to Casey's vote to confirm former Kansas governor Kathleen Sebelius (a Catholic who supports abortion rights) as Secretary for Health and Human Services, Martino said it was "sad and disappointing" that the college chose to honor a Democrat who could not "muster the courage" to oppose "the pro-abortion agenda." Two days before Casey's address at King's, Rigali issued a statement "applauding" the Senator for introducing legislation to promote policies that encourage women facing unplanned pregnancies to carry their babies to term. In the highly ritualized world of church communication, the Cardinal's announcement was akin to a public smackdown of Martino. One month later, Martino was summoned to Rome, and submitted his resignation. 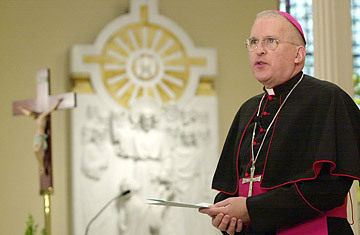 Martino's departure comes just weeks after the Archbishop of Santa Fe became the first church leader to speak out publicly about the increasingly political behavior of a minority of bishops within the conference. Archbishop Michael Sheehan told the National Catholic Reporter on Aug. 12 that he spoke out during the bishops' meeting in June, saying they risked "isolat[ing] ourselves from the rest of America by our strong views on abortion and the other things. We need to be building bridges, not burning them." Building bridges has also been the public posture of the Vatican when it comes to the Obama Administration. The Vatican remained silent on Notre Dame's decision to invite Obama to speak. And although Pope Benedict XVI expressed his disappointment with Obama's support for abortion rights when the two met in July, a Vatican spokesman went out of his way to state that the Holy Father was "very impressed" by the Democratic President. But that approach is clearly anathema to Martino, who has no regrets and no doubts. "My devotion to the sanctity of life is a long-standing and visceral principle of my standard of acting and being," he said at Monday's press conference in Scranton. "We must work to overturn a profound cancer in our society, this sin of frankly murdering 50 million. We have become quite blasé about that, and that scares me very much."